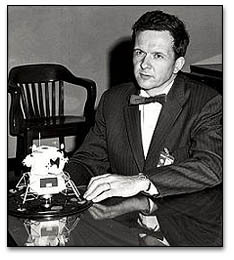 Thomas J. Kelly, of Cutchogue, is retired president of the Grumman Space Station Integration Division and formerly lunar module engineering director. When the sun's nuclear furnace finally burns itself out, one of the last solar reflections will come from six spacecraft built on Long Island that have been sitting on the surface of the moon for the past 30 years. They are Grumman Lunar Modules, a legacy of the days when Grumman Corp. was an independent company known for its engineering prowess. They are also the product of a national mandate to go to the moon as a means of demonstrating our will during the Cold War. And indeed, the first of them did just that, as U.S. astronauts made the first lunar landing on July 20, 1969. For some 7,000 Grumman employees, however, it was far more intimate than an issue of national prestige. We felt personally empowered to put Americans at the edge of a frontier that even today seems incomprehensible. Yet not only did we succeed in meeting the mission; the efforts of our nation's commitment to lunar exploration also inspired people around the world and showed the finest possibilities of human achievement and of creating technology that now helps to power our society. When I was chosen to lead the engineering team to create the LM, nobody knew what a manned lunar landing spacecraft should look like. So we just let function determine form, and ended up with the spindly insect-like creation that was aptly named Spider by the first crew that flew it in space. It had to be very light, because every pound that was taken to the surface and returned to lunar orbit required three pounds of rocket propellant. But because the LM only operated in space, and didn't have to withstand the high gravity loads and intense heating of re-entry through the Earth's atmosphere, it could be designed primarily for the light loads encountered in free space and during lunar landing and liftoff. Nobody at Grumman who worked on the LM will ever forget it. Even the 12-and 14-hour weekdays, the frustrating paperwork and the sheer complexity of designing, building and testing the module could not dim our dedication. From the sweeper to the chief engineer, we all knew that we were part of a majestic endeavor, that we were making history happen. Several times I saw work crews in the assembly areas continue with their tasks long after the overtime pay that had been budgeted for them was exhausted. No one cared; the focus was exclusively on getting the job done, and doing it right. And, 30 years ago, the LM carried our astronaut friends, the prestige of our country, the Grumman logo and our personal reputations to the surface of the moon in the full glare of world-wide TV coverage. We received a daily education offered up by the frustrations and accomplishments found in the module assembly bay. We were hand-building the spacecraft and no one had a guide book. Even simple wire installation became a test of our inge nuity. The thin 26-gauge wire used to save weight on the LM broke easily during installation, requiring our technicians, to develop educated "tender touch" fingers to put the wire bundles and connectors together. From propulsion to life support, we were challenged to invent systems that, as in the case of using the LM for a "lifeboat" for the damaged Apollo 13, wound up performing far beyond their design requirements. On the 30th anniversary of the lunar landing, the accomplishments of thousands of Grumman employees will be celebrated by the Cradle of Aviation Museum in Garden City not far from where the LM was created. Families are donating dollars in support of the museum so that their names will be enshrined on the Cradle's Honor Roll, along with many other aerospace veterans, as a permanent tribute to their achievements Also featured at the Cradle will be one of the last LMs manufactured at Grumman but destined never to fly. While denied its place on the lunar surface, this flight hardware will allow future generations to discern the legacy of men and women without the need of a telescope. In doing so, they will find the handiwork of Long Islanders who used technology for the peaceful exploration of space and, in the process, created th e pad from which we launched the Information Age.